Meet Maria J. Andrade, M.F.T. You have been invited to share your promotional experience with others. Your Name: Maria J. Andrade, M.F.T. 1. Where you are from and where are you now? raised in New York and in California where I now live with my husband,Sy. 2. How did you get started writing? 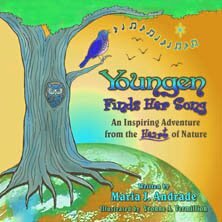 Singing My Self Home, a spiritual journey on the crisis of our time and my recent eco-social book and CD for children, Youngen Finds Her Song, which contains allegories about their global inheritance. 3. What do you do when you are not writing? Maria: I work with people in the field of counseling every day. I also garden, read and work on my house, which has become synonymous with working on myself! 4. What would readers like to know about you? 5. What inspired your first book? Maria: The divorce rate. Its like a crap shoot. One out of two marriages ends in divorce. 6. How many books have you written? a science fiction novelette and a novel on the life of 3 women’s friendship which takes place in the 30s and a comedy play which I hope will be published by 2012. 7. What are the titles of your books and what genres are they? Maria: “Why Dear Mrs. Sullivan Is Distressed” and “Buster” are children’s stories in poetry. “Jennifer Magicum” is also for kids. The science fiction story is called, “The Return” and I don’t yet have a title for the novel or the play. 8. How do you decide on that topic or genre? Why are you specially qualified to write about this topic? Maria: I write what insists on being written and there are a lot of topics fighting for my attention so I usually give in to the one that most vehemently pursues me. 9. How do you manage to keep yourself focused and on track when you’re writing a book? Maria: Guilt- in part.I am sure I would have written much more if I had been more focused. My problem is I am interested in any number of things but I also have this commitment to my writing like a mother has to her children. It isn’t just about bringing them into the world but it is also helping them find a place there so they can have lives of their own! 10. Do you write to make money, for the love of writing or both? The priority is writing which I have done when I made no money at all at it but I like to know people are reading my work so obviously I will get paid. I have also given books away. This last book, Youngen Finds Her Song, An Inspiring Adventure From The Heart Of Nature, which as I mentioned, has an audio-book version with the voices of birds and insects conversing about “humans” and special sound effects and music. We gave many of the books and CDs to children who had special needs. It is a book about hope, self-confidence, caring, earth stewardship and peace and I wanted to give it to them as a gift. such as with this blog here with you! I appreciate the opportunity to be here. 12. What are some unique methods of marketing you have used? Which were the most successful? Maria: Although the book just came out barely a month ago it is already being used in schools. This is because of the work the publisher has done to inform teachers and libraries. We also have started a contest for students who write essay about the four basic concepts in the book, which includes some kind of drawing with it. 13. Do you sell through a website? If so, what’s the address? If not, why not? 14. Where can people order your books? 15. What format are your books – e-book, print, audio etc? Maria: I mentioned print, audio and also e-book. 16. Will you write more books? Maria: Do dogs have fleas? How many is the question based on what the gal upstairs decides. 17. What do you have in the works now? Maria: Most immediately I am working on the illustrations for one of the children’s books and I want to finish what needs completion the play and novel. 18. What does the future hold for you and your books? Maria: I intend for people all around the world to read my books while I am above the sod. So I have my work cut out for me don’t I? Right now my children’s book, “Youngen” and “Rufus” (the two main characters in my book -birds) have flown to Canada to be part of the “Blossom Project” an organization that works with girls who are the first to go to college. They are also flying to Africa – to be part of the Woza Moya Poject to help children who have Aids. These are two good organizations for your audience to check out. Who knows where my books will go next? 19. What was the most successful thing you did to promote your books? Maria: Make connections with organizations and people like you. 20. What was the least successful thing you did to promote your books? Maria: Probably press releases. I wonder if anyone actually reads them? 21. Tell us about your most recent book. Maria: This is a story about a small Thrush, who accompanied by her friend and guide an Owl, goes on a journey to find her unique song. She starts out without one, which is rare for a Thrush because they are beautiful singers. This is partly due to the fact that she has no confidence in herself. In one chapter she tries to put other bird’s feathers in her own! are like and learns about the incredible beauty and wonder of the world around her. 22. What makes this book special to you? Maria: This book contains everything I believe in. 23. What sort of comments have you gotten about the content of the book? A teacher wrote: Fabulous story! There are lots of insights and lessons for young readers. For myself, once I started reading, I did not want to put it down! 24. What makes this a book that other people MUST read and WHY? Maria: I believe there is crisis in our country and around the world, which is social, economic, moral and spiritual. Fundamentally it is an opportunity for the human race to re-evaluate its priorities. My book written for children allows us to see what is truly important in life. These are things like family, friendship, community and the connectedness of all life. I think our ability to choose our priorities wisely now is a matter of our survival. 25. What people NEED to read this book and WHY? Maria: We need to get in touch with hope and this book offers that vision! It is not a Pollyanna kind of hope but based on some facts which people of all ages need to know. Maria: I love poetry and a good poem sparks my creativity but so does a good meal. I think it is important to be open to the world, people, nature, beauty, books, art. Etc. Keep being curious and being open to learning. I was thinking of learning to play the ducimer. I am as old as dirt but hey, I would love to play that instrument when I do a poetry recital. 27. What do you think motivates people to become authors? What motivated you to get into this unusual industry? Maria: The need to communicate with large numbers of people about things you care about motivates authors. However, they usually begin by writing for themselves. I wrote poetry as a kid because I was moved by joy, sorrow, fear etc. I also wrote plays to see words come to life. It is something that is organic like becoming a kind of tree. 28. Tell me about the most unusual things you have done to promote any books? Self-confidence, Community, Earth Stewardship, or Peace. Maria: Teach Your Children Well! This book contains a essential values not only for an individual to create the “good life” but these are life enhancing values for a united World. 30. Why does the topic of your book interest you? Why would it interest potential readers? Give us a hook to reel in new readers. Maria: The major theme of the 21st Century is “Relationship” with self, other and the natural world. The lone wolf mentality is over. We can see that as we look at the impact of things like global warming, the economy, and human rights. We will either make it together or we don’t make it at all. My book reminds us that our chance of making is – good!